dxi initi gubidxaca’. the day the sun dies. In the week leading up to the last day of the year, life-sized bodies appear in chairs and in doorways of houses around Juchitán. Slupmed, arms dangling, they’re made from a pair of old trousers and an old shirt, stuffed with whatever’s on hand, with a head and painted-on face, a hat, sometimes shoes, and often with some empty beer bottles at their feet. They’re viejitos, little old men, a traditional representation of the old year. At midnight families set their viejito on fire, and to a huadá, foreign girl, the city looks like a war zone, with burning bodies and smoke in the streets. A little girl says to her mother, ‘I’m sad that they burned the abuelo‘, grandfather. The old year has officially died, and makes way for celebrating the new year, which is greeted with a rush of firecrackers, embracing of family and friends, wishing all a good year. Family visits continue through the night. I’m sitting at the table of a friend’s family, with the females– mothers, cousins, sisters. Among the many foods being served are huevos de tortuga, sea turtle eggs, a popular regional food. Many people will talk about sea turtle eggs and the even more symbolic iguana, guchachi, as important zapotec foods– hardly ever will anyone mention that they’re both considered endangered, and that there are laws preventing their consumption. Laws are made far away, and their presence is hardly felt, if at all. 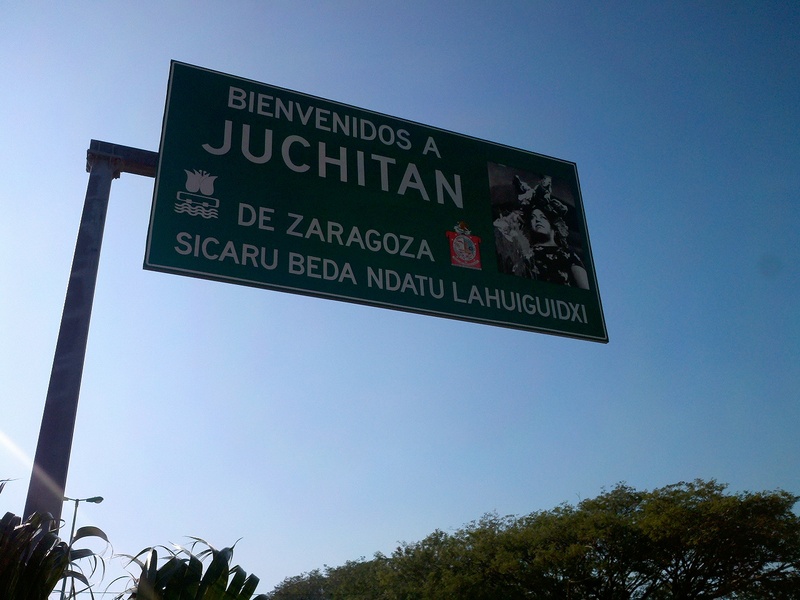 Many people don’t know that Zapotec, along with 363 other previously persecuted lenguas oríginarias has been recognized as a national language since 2003. Word has yet to arrive that hunting iguana and sea turtle eggs is now officially bad, and speaking Zapotec is officially good. A cousin asks me if I’ve tried other traditional zapotec foods, and whether I enjoy them. I’ve tried iguana I tell her, giving the desired signal that I appreciate local culture, that I value the things they value. As a guest it is impolite to refuse food that’s offered you, and much as I don’t want to contribute to the death of the last iguana, or the non-birth of turtles, raising such rich-world objections doesn’t seem like an option when a kind hostess wants to feed me and her family the best she has. A woman has brought 4 young girls with her, daughters, nieces. They sit at the table to eat before scampering off to play with the granddaughter who lives in the house. As I have seen around other tables during the 5 months I’ve been here, the mother speaks Zapotec with her female peers, then addresses her daughters in Spanish. She uses just one Zapotec word with them, ‘mama‘, a term of endearment. The girls will play together in Spanish, when they go home there will be Dora on TV speaking Spanish and English, and when the holidays are over they’ll return to schools that judge them based entirely on their ability in Spanish. (Except for that occasional recitation contest.) Over many such moments, each one adds up to more use of certain ways of speaking, less use of others. Around the family table the flow of communication continues, ‘pass your sister the tortillas mama‘, ‘greet your aunt‘, ‘eat your huevos de tortuga, so you can grow strong’. As the night ends and the sun starts to rise, piles of ash from the burned viejitos blow around the streets, up against the walls of homes that have been freshly painted for the new year.